Usually an artist would be devastated if connoisseurs walked all over her art. But for Patricia Dreher, this is a sign of acceptance and appreciation. 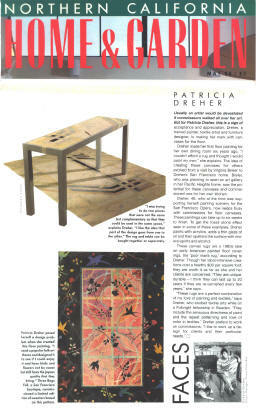 Dreher, a trained painter, textile artist and furniture designer, is making her mark with canvases for the floor. Dreher made her first floor painting for her own dining room six years ago, "I couldn't afford a rug and thought I would paint my own," she explains. The idea of creating these canvases for others evolved from a visit by Virginia Breier to Dreher's San Francisco home. Breier, who was planning to open an art gallery in her Pacific Heights home, saw the potential for these canvases and-commissioned one for her own kitchen. Dreher, 46, who at the time was supporting herself painting scenery for the San Francisco Opera, now keeps busy with commissions for floor canvases. These paintings can take up to six weeks to finish. To get the fossil stone effect seen in some of these examples, Dreher paints with acrylics, adds a thin glaze of oil and then spatters the surface with mineral spirits and alcohol. These canvas rugs are a 1980s take on early American painted floor coverings, the "poor man's rug," according to Dreher. Though her labor-intensive creations cost a healthy $30 per square foot, they are worth it as far as she and her clients are concerned. "They are unique, durable - I think they can last up to 20 years if they are re-varnished every few years," she says. "These rugs are a perfect combination of my love of painting and textiles," says Dreher, who studied textile arts while on a Fulbright fellowship in Sweden. "They include the sensuous directness of paint and the repeat patterning and love of color in textiles." Dreher prefers to work on commissions, "I like to work up a design for clients and their particular needs." I was trying to do two pieces that were not the same but complementary so that they could be used in the same space," explains Dreher, "I like the idea that part of the design goes from one to the other." The rug and table can be bought together or separately. Patricia Dreher posed herself a design problem when she created this floor painting. "I used a popular folk art theme and designed it to see if I could enjoy it and have birds and flowers not be sweet but still have the joyous quality that they bring." Three Bags Full, a San Francisco boutique, commissioned a limited edition of sweaters based on this pattern.